You know the saying, “do as I say, not as I do?” Here is the skinny of what I learned this year so you don’t repeat my gardening mistakes. I find gardening can be like an Indiana Jones movie. There is peril, unsolved mysteries, and triumph all in one season. Many of my loyal Green Talk readers (you know who you are) have weather slugs, rabbits, and plants on steroids with me as I have gardened over the last couple of years. Each year I try something new in the garden or do something different. In turn, Mother Nature keeps me on my toes, and changes the course of my plans whether the cabbage worms try to devour my broccoli, my Swiss Chard went to seed, or my beans withered from the heat. Am I passionate about gardening? You betcha. Gardening is a wonderful outlet for me. I get to take my frustration out on unloved flowers (weeds), scream out those blasted crows who eat my tomatoes, and eat the most delicious strawberries and blueberries right in the garden. I still marvel at a seed that become a seedling so effortlessly. Each September, I mourn the end of my gardening season wishing that I had just a little more time for those tomatoes to ripen, the peas to produce more pods, and the beets to sweeten. I even try and extend my summer by bringing in a ton of tomatoes to ripen in which only a quarter of them make it. How many of you feel the same? In February, I start again. Thinking about what veggies to put in the garden. What new bed to create. And finally (and I say hallelujah) I start my seedlings. So, what did I learn this year so far? Read how to cut back a perennial before you do. I started to cut back my overgrown sage thinking it would grow from the bottom. It actually grows on old wood. So I stopped in the middle of my plant’s haircut sensing I was doing something wrong. Now it looks like someone ate out its middle. I could always blame my ground hog. Don’t plant perennial herbs in your raised beds unless you don’t care if they take over the bed. I planted rosemary and chamomile in two different beds. During the summer, my oregano plant went bananas and became this huge mass plant. Anything in its path was engulfed. My thyme next door to the oregano hardly had a chance. So, why didn’t I cut it back. Two reasons. I wanted to see what it would do and it was the most beautiful plant I have ever seen. It had mounds of purple flowers and the bees just adored it. We gardeners love bees for all the hard work they do in the garden. I should have moved it in the fall. I waited until Spring. As it started to come up, it seemed larger than I remembered. If you can imagine a sash across an 8 by 4 bed, then this is how large this plant had become. I don’t know if it is the compost, the raised bed, the type of oregano plant, or just my luck as to why this plant is so big. I have limited space in the garden and this ultra-oregano had to leave. The sage plant in the bed across the way, was just as large and set to spread across that bed. Don’t even go there on discussing how large the chamomile grew. I found a new place for the sage and oregano outside my garden since the deer (hopefully) would not bother these two perennials. The chamomile would be used to fill in between the raised beds as ground cover. All that had to be done was to dig them out. Not to hard, since my raised bed’s soil was pliable and loose. Boy was I in for a surprise. Think of those movies where the hand of time start spinning quickly. What I thought would be a 1 hour dig because an archeology experiment in finding the root of the Sage plant. Those blasted roots were so long that I had to cut one root since it was underneath the bed somewhere and I wasn’t digging to China to find it. I did not fair well with digging out either the oregano or the chamomile. Think heavy, heavy piece of sod. The more I dug, the endless both seemed. Finally, 3 hours later I dug out the sage, chamomile, and oregano. I could barely carry the oregano since it was so heavy. The sage and oregano were put in water until I dug a new bed for them. The chamomile was broken up and disbursed throughout the garden. I needed either a strong drink or massive pain killers since my back and shoulder were in a knot from all my digging. Next, was to create my new perennial bed. Just because you go to the gym does not mean that you can dig a bed. The first time I put my spade in the ground, I thought I sprang my wrist. You know those comic strip bubbles which have all the curse words in funny symbols? Well, that bubble was coming out of my head. Digging up grass is really hard. After an hour of only creating a one by one foot, I gave up and retreated to my computer to see if there was an easier way. Given my luck, a spade was my only choice. Frustrated as ever, I finally resigned to asking my husband and sons to crave out a little bed for the plants. I hope that I have not killed the plants. Think what room you have in the garden before you go overboard with buying seeds. Somehow I ordered 5 different types of squashes. Squash takes up a lot of room! So, where am I going to plant them? Early birthday gifts for my gardener friends? Also consider using companion plants to naturally deter insect. This year I am planting borage, marigolds, and nasturtiums all around my plants. See here for a handy guide of which plants get along and others that you should keep away from each other. Who needs squabbles in the playground? Seeds have a certain life. I keep my seeds in the refrigerator, but this year some of the seeds did not germinate. Perhaps considering sharing seed packages with friends so you don’t have to worry about your seeds expiring. Plus, it will cost less. Do your homework before you plant your plants. Find out whether your plants like sun or shade, if it will survive in your zone, what type of soil does it need, and whether deer like it. Otherwise, you are just throwing out your money since the plant will not thrive, or worse be eaten. I planted coral bells in full sun. They are shade loving plant. I have been trying to devise an umbrella for them so they get some shade. My Verbena did not survive in my zone (5) despite my argument with my landscaper. So if you want to waste your money for something that looks good for a year, go ahead and plant it. 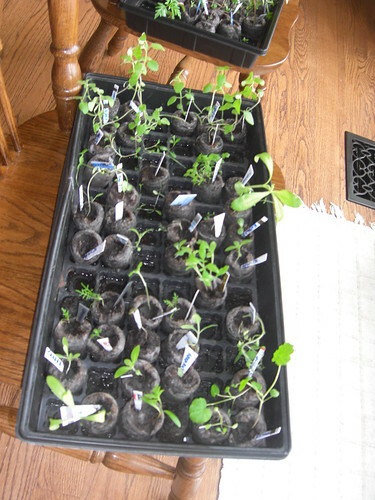 Try planting flowers from seed. It is less expensive and they bloom quicker once you get them into the soil then starting from seeds in the grow. This year I am growing cosmos (see above), calendula, and snapdragons which was so easy to grow from seed. Part of the reason why I grow from seed is because I am notorious for pulling out my fresh seedlings thinking they are weeds. (Remember, I get great pleasure in pulling weeds.) Last year I could not figure out why my zinnia’s never came up. In hindsight, I realized that I pulled them out! Plant a different variety to spice things up in the garden. This year I picked another type of heirloom sauce tomato and different color basil. Perhaps this year my kids will like my home-made tomato sauce? I am also trying my hand at watermelon! Readers, what have you learn from the last season? All of us gardeners need some advice! Ooooh, chamomile is perennial in zone 5? I’m going to plant some in my new flower beds for color and later on tea. Thanks for the tip. Buy too many seeds?? NEVER! Not me!! 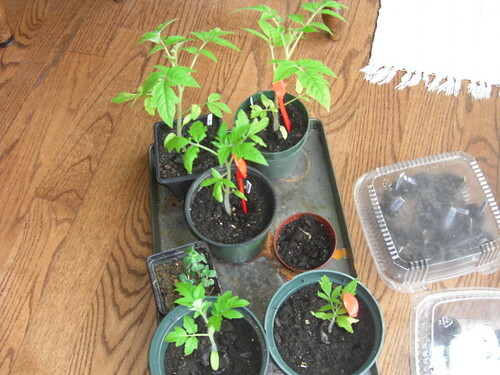 I didn\’t realize, though, that they won\’t grow. I had read somewhere that most seeds last for 2 or 3 yrs. 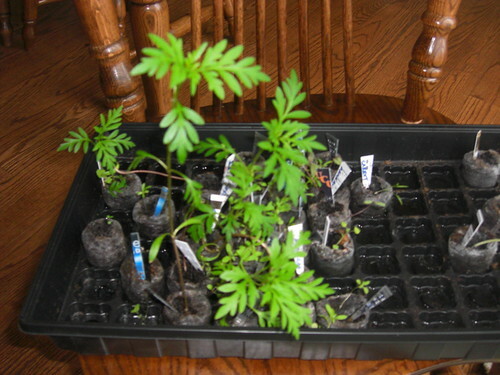 Here\’s hoping because I am planting some of my extras from last year. That said, I\’ll take your advice and give some of the rest to friends this year. Keep up the good work! I’ve learned not to let my husband go to the garden store or any seed websites unsupervised. 😉 He’s notorious for buying too many seeds and has quite the stash. I’ve at least broken his gourd habit. He always swore he would dry them and use them in craft projects – nope! They just go to waste. He has to do something with the few he has dried before I will let him plant more. On the plus side, we’re now better at planted seeds that are aimed at reducing our food bills. I’ve also learned that certain varieties are popular for a reason, mostly having to do with flavor. We planted some carrots last year that were just plain bitter! I think I’ve been inspired by all those seemingly wild English gardens. Great tips! I will come back and refer to this. I need all the help I can get with gardening! Excellent post! I love finding great gardening tips and advice from professional and experienced gardeners. My mother and friend are going to love this post, thanks for sharing this with us, you have done a truly awesome job. Anna, oregano is a member of the mint family. I have had the same problem with it spreading, and when I find a tiny start in some other part of my garden I rip it out immediately. I believe I planted four or possibly five little tiny plants 20 years ago, and they immediately spread to take over one entire arm of my raised herb garden. All of the mints spread in this manner. If you want to control them, here are two suggestions. Sink a terracotta chimney flue deep into your garden, fill it with dirt, stopping a couple inches short of the top of the flue and plant. Or, buy lightweight oversized containers. You can set them on your steps, or on the sidewalk, or even in the garden. Be sure to prune the plants starting at the end of May, to encourage the plants to become bushy, and keep them from getting leggy. Good luck next year! .-= buffy´s last blog ..Senior Moment =-. Perfect article! We once lived on a large property. It had no top soil so raised beds were a must. We had little water so mulching was imperative. We planted the toughest and prolific growing plants and I must say we enjoyed cutting back these plants. They actually served to support the other plants by keeping their roots cool.